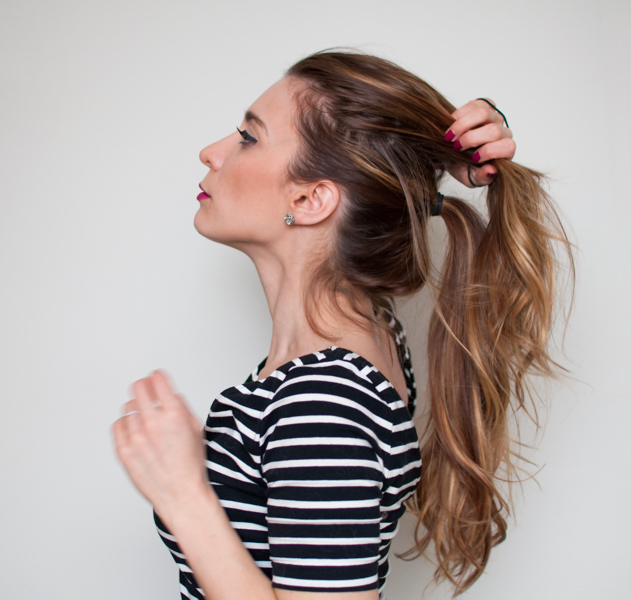 Easy Extra-Long Ponytail Hair Tutorial | La Petite Noob | A Toronto-Based Fashion and Lifestyle Blog. I've been doing a lot of hair tutorials lately, haven't I? Truth be told, I lose all motivation to put any effort into my hair during the winter time so I rely on quick and easy hairstyles to get me through. Why not share them? Today's tutorial is how to achieve this very quick, very easy extra long ponytail - naturally, without the use of extensions. How amazing is that? 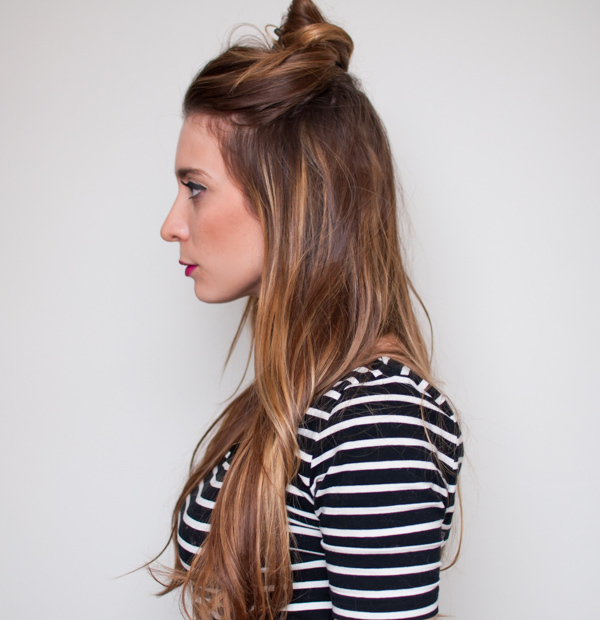 Check out how you can get this super-simple hair style for yourself. As per usual, I'm starting off with some big messy hair. I find that most hair looks work best with second or third-day hair that has a bit of texture to it. If my hair is looking a little flat, I like to spray in some dry shampoo to my roots for an extra lift and added texture. Start by separating your hair into two separate sections. Clip the top section of your hair to keep it out of the way for the time being. Gather the bottom half of your hair that's loose and tie it all into a tight ponytail, making sure that it sits slightly higher than the middle of your head. Once you're happy with your first ponytail, release the second half of your hair that's been clipped to the top of your head. Gather all of the loose hair at the top of your head, and tie it all into another ponytail - making sure that it rests directly on top of the first ponytail. At this point, I like to give the top ponytail a bit of a tease at the roots. 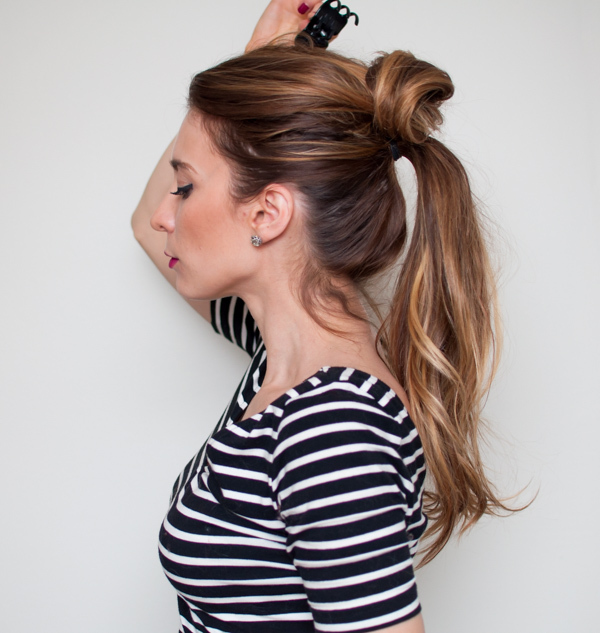 By backcombing the top ponytail, it helps to conceal that there is another ponytail right underneath it. And that's it! 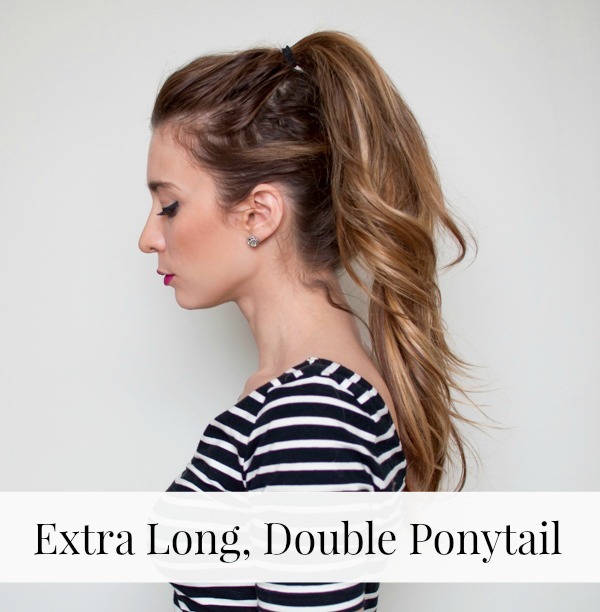 A super simple, extra long ponytail that takes minutes to do. People will think that you hair has magically grown overnight! I always get questions about my sudden boost in hair lenth when I wear this style. Try it out, and let me know how it goes! I love this trick. It's so clever!! I'm definitely all about the easy hairstyles in the winter too. Ain't nobody got time for that! 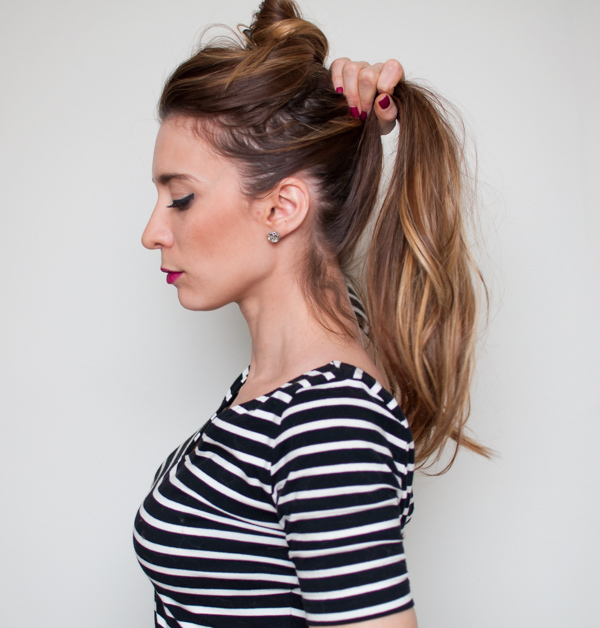 Give this ponytail a try! 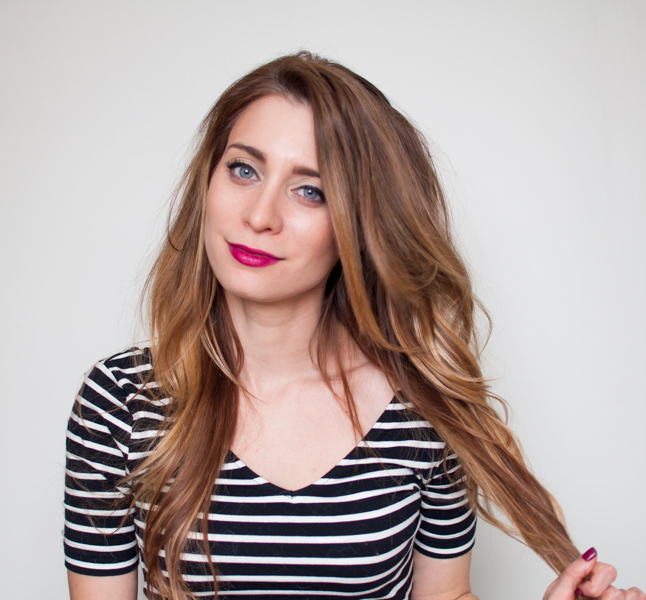 I use my hair as a comfort blanket too, but still like how long and voluminous this look can be! Great tutorial! Makes me miss my super long hair! Don't, it's such a pain most of the time! I've been coveting the long-bob for some time now. If only I had the courage to make the cut! I love love love this look. I've never tried it but it looks like such a simple style yet super pretty! It's so super easy Amanda, I hope that you try it! When you do, let me know how it turns out. Easy tutorial! Definitely have to try it out. Thanks Emma, let me know how it goes when you try it out!